According to Our FTLunarAdvancedCalendar ... the first part of this year began on a Mars-day ... and the second under Mercury. I, Giovanni ... uses more my Advanced Duodecimal Calendar than the normal Gregorian/Julian Calendar ... of course both. expecting from God the return gift of one's Real Self. 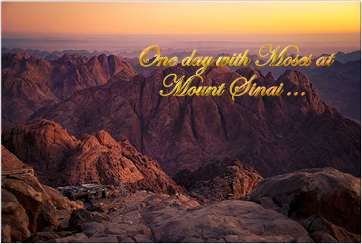 But the lesson of today ... regards ... Mount Sinai .. and Moses. When Moses walk up to Mount Sinai? ...Simple ... In the Age of Aries ... when Humanity's Test was ... "One Lord" ... not yet acquired. You and me ... and everyone today live Christmas ... but ... Again ... You kill ... "The Son" ... so, neither the Test ... "The Father has a Son and he is God" has been digested. In the next 2000 years ... until the year 4120 ... We and all that remains must solve the concept ... "God is also Woman ... " ... including the Test to finally understand ... "Who is the Holy Ghost". My blessed chelas—truly sons and daughters of the Christ flame—here and now accept the comfort and assurance of the truth I bring you, that once you have consciously and determinedly entered upon the spiritual path, henceforth you are never alone! There is always one or more of us standing guard over you through our Electronic Presence stationed at your side; or we may assign an angelic guard to watch with you and to keep you and your loved ones in all your ways. We who are endeavoring to help you gain your freedom from every binding karmic condition periodically look over your worlds to ascertain what more we can do to hasten your deliverance from the shackles of the human consciousness. At such times it is our greatest desire for you to receive some grant or dispensation from the great Karmic Board that would enable you to see your own beloved I AM Presence face to face in all its Godlike majesty and effulgent glory. Of course we are wholly God-free beings in our own realm and right; yet we are absolutely, willingly and joyously obedient to the Great Cosmic Law as well as to the law of your own free will and karma, trusting completely and resting serenely in its wisdom at all times. Know, then, that by revisiting in your mind’s eye the loving face of your Presence, that Divine Love’s impetus in your endeavors will quickly and completely purify your four lower bodies, your thoughts and feelings, and your affairs. Know that by Divine Love’s alchemy this will take place as you engage in an even more intensive use of the violet transmuting flame than you have ever engaged in before. And know that when you have used that violet flame enough, the glory and the magnificence of Divine Love’s I AM Presence can no longer be hidden from you—even from your physical sight. Nevertheless, when Moses came down the mount Sinai the second time with two tables of testimony in his hand, he was not aware that “the skin of his face shone while he talked with the Lord.” <4> And Aaron and the children of Israel were afraid to come near; wherefore Moses put a veil on his face while he spoke with them. But when he went in before the Lord to speak with him he took off the veil. And so it was that though he himself was not permitted to see God’s glory, this glory shone upon him as a testimony of the Lord’s Mighty I AM Presence to all the people. And they believed on Moses as the Messenger of the Lord; for they saw the Lord’s glory, not face to face but reflected upon the face of Moses. So much for the dispensation of Moses: “And the glory of the Lord shone upon him....” But with the coming of Jesus Christ and the Piscean dispensation the door to the I AM Presence was opened to the children of God. The Father sent his Son, the Only Begotten of the I AM THAT I AM to be the Blessed Mediator between the plane of his absolute perfection and the plane of imperfection to which his errant children had descended. Thus, since God sent his Son into the world, that through him the world might be saved,thousands of unascended lifestreams yet bearing their karma as Moses did, even many who were unaware of their own I AM Presence, at some split second when (even unknowingly) they made a certain attunement with their Holy Christ Self, that Presence has been visible to them for just a moment. Often they thought the Presence to be some angelic messenger, delivering a blessing of illumination, protection, warning, or whatever the Holy Christ Self deemed necessary at the time. And the fullness of such a blessing might not even manifest in their outer experience-world until some later date. Now, this glimpse of the I AM Presence may have seemed to the outer self a happenstance, although it really was not. Everything in our realm as well as in yours works according to cosmic law. If there be an effect, there must be a cause to have produced it. In this instance the effect, the sight of their own Beloved God Self, was a gift of grace that they had earned somewhere in some way. In the case of an awakened or fully enlightened chela, however, the appearance visibly and tangibly of his I AM Presence will not be just an isolated manifestation. Once the God-conscious chela has arrived at that purified state where he can see his Presence face to face, by spiritual attainment rather than as a gift or grace, then he will be able to see the Presence at will and by cosmic law the sight thereof can never be shut off from him again. I know that you now see much more clearly than ever before how desirable and rewarding to you is your constant, grateful, and joyous use of the violet transmuting flame. For at any moment of any hour of any day when you shall have purified yourselves enough and when the attunement between you and your Holy Christ Self is in accord, your lovely, radiant I AM Presence will reveal itself to you. Do you not think that the Father longs to reveal his Presence to you, loving you as he does above all else and all others? The Light of God’s Presence is an all-powerful magnet to draw your attention to itself. And through your attention the Presence then draws all of the energies which you have used and misused throughout the centuries of your embodiments here on earth into the sacred fire for transmutation. In your daily application of the Word in prayer, affirmation and decree, as you send your sincere love and gratitude to your I AM Presence for life’s opportunities, ask the Father to reveal himself to you in your full waking consciousness. And the Father will answer you according to his cycles and he will hasten your experience of a personal victory. May I gently suggest, dear chela, that you give to this ritual some definite daily attention this week. This joyous manifestation will increase your faith no end and multiply all the good in your world. And as an additional help, try to manifest in your daily living at least one of the Godly virtues of your Beloved I AM Presence as expressed and demonstrated to you by your Holy Christ Self, virtues such as divine patience, mercy, justice, kindness, generosity, strength in the Light, etc. Also, try blessing your friends and all whom you meet with a special manifestation of the Blessed Mediator each day and thus expand the Light of the I AM THAT I AM in the world everywhere you go. Then at the close of your day humbly enjoy reviewing the visions of the faces you have brightened with your smile, the hearts you have lifted, and the karmic loads you have lightened. I say “humbly” because it is your lovely I AM Presence who has rendered this service through the Holy Christ Self through you! Make it a point each day to transmute the mistakes of yesterday by good works and words of comfort and cheer—charged with the violet flame you so intensely invoke. Make it a point to consciously expand more and more of the Light of your Presence by using the day’s allotment of energy to magnify your Lord and multiply your works and words by the threefold flame of your Holy Christ Self anchored within your heart. By this deliberate action know, chelas of the will of God, that you are gradually but surely making the radiance and the reality of your I AM Presence both seen and felt in this physical appearance world. Then one day not only shall you be able to see that Presence at will but you will actually have become its very God-perfection for eternity in the victory of your ascension! Beloved Immaculata, Silent Watcher of the earth, will help you to achieve this goal if you will ask her. She is so willing (as we all are) to answer your every call for more Light and more of God’s perfection. I know that the very possibility of seeing your Presence face to face, which I have set before you this week, will bring a tremendous lift to your spirit. And I, who love you with an intensity that no unascended being can understand, await your calls—always first to your beloved I AM Presence and then to us—so that I may joyously help you to manifest God’s will for you. This instruction comes to you through the loving courtesy of the Ascended Masters’ Darjeeling, India, Council of God’s Will, of which all the ascended host are members.